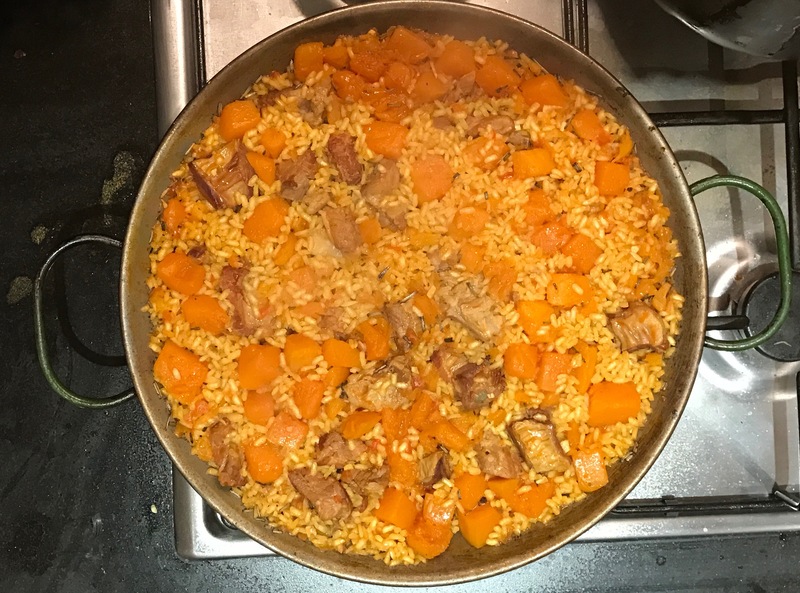 Lets gonna start dicing the Pork ribs in small pieces, bite piece, and we gonna fry it on the paella until is golden.Then add the butternut and fry it , when starts to get some colour add the chopped garlic and leave frying for 10 seconds, then the smoked paprika for just a turn and add the tomatoes grated. Fry it slowly until the tomato starts to take a brown colour, incorporate the herbs. Cover with water and leave it simmer for an hour and a half. To measure the rice amount do a line from one side to the other of the paella. Distribute it on all the paella and leave it boils hard until the stock starts to get thicker, at this point is ok to move there rice , but once it get thicker we have to leave it rest. 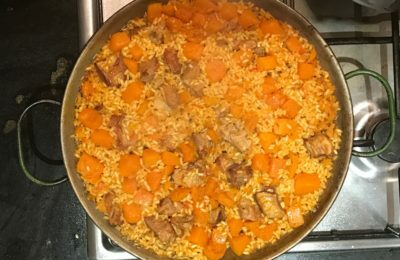 With these rice we need to be careful because of the high quantity of sugar on the butternut the rice caramelise more easily on to bottom of the pan. Put it on minimum and leave it to boil until the stock is consumed and the rice is dry. Cover it and leave it to rest for 5 minutes.